Ki Pro Ultra is a next generation file-based 4K/UltraHD/2K/HD video recorder and player with a built-in HD LCD monitor; capable of capturing edit-ready Apple ProRes files in a range of video formats and frame rates up to 4K 60p. Ki Pro Ultra offers flexible input and output connectivity including 3G-SDI, HDMI and even Fiber, for powerful and efficient large-raster and high-frame rate workflows. Designed to be both portable with a built in carry handle or rack-mountable with half-rack wide 2RU high dimensions, Ki Pro Ultra suits a wide range of production and post environments. Building on the prominent Ki Pro line-up, the Ki Pro Ultra 4K/HD 3G-SDI/HDMI Recorder/Player/Monitor from AJA delivers 4K DCI/UHD recording and monitoring in a rack mountable unit. You can record 4K in DCI, UHD, and HD up to 60p. The centrepiece of this recorder is its integrated 4.8" HD resolution screen, providing a well-defined image for reviewing footage. Accidental power loss, or failure of a power input are mitigated by the two redundant 4-pin XLR inputs. The Ultra also comes with ports for Fibre input and output, requiring optional Fibre SNFs. 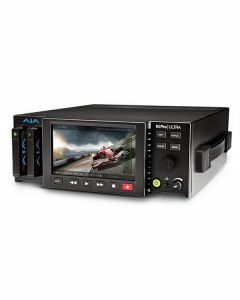 ProRes codecs up to ProRes 4444 are supported and familiar VTR-style front panel controls coupled with intuitive design mean that the AJA Ki Pro Ultra is incredibly easy to use whilst recording your input video into a robust edit-ready format. Twin media slots permit rollover recording, allowing recording to switch from a full PAK to an empty one without dropping frames. The unit can be remotely controlled with either RS-422 or an ethernet connection, making it suitable for use rack-mounted in a machine room or individually for desktop. The Ultra can also be lent portable characteristics thanks to an included attachable handle. Alternatively, desktop feet can be attached to create a standalone unit for desktop use. An optional rack shelf also allows you to mount this half-rack wide component.